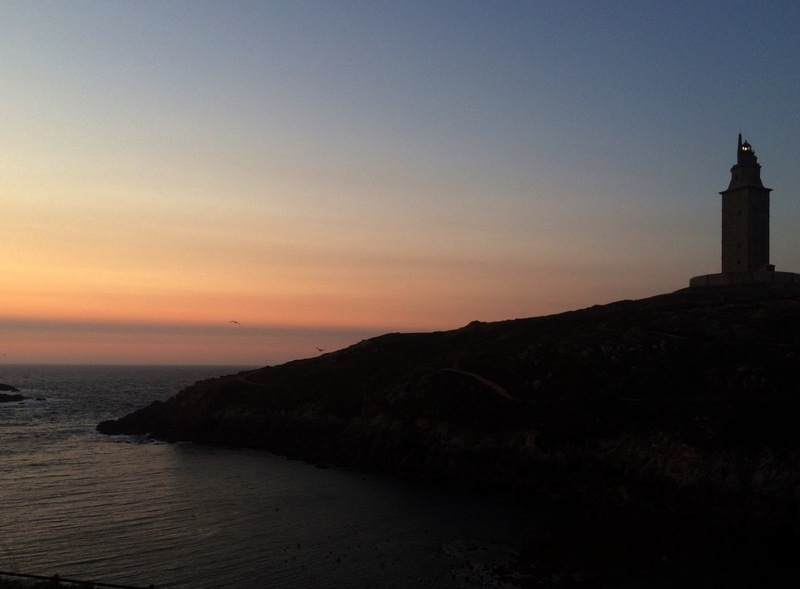 Between the cove of Orzán and Golfo Ártabro, in A Coruña, rises majestically the Tower of Hercules, the oldest Roman lighthouse in the world and the only one that is kept in service. Its construction dates back to the first century, under the command of an architect from Coimbra called Gaio Sevio Lupo, who dedicates his work to the god of war Mars, as can be read in an inscription at the foot of the tower. Already since centuries before Christ, there existed in the bay of A Coruña a town of Celtic origin known as Brigantia in which the “ártabros” inhabited. Due to its strategic location, it is here that the Tower of Hercules is built, with the aim of guiding the boats that sailed to the British Isles in search of tin, copper and iron. During the centuries of Romanization, the tower serves as a lighthouse, until in the fifteenth century the Norman attacks force the inhabitants of that primitive population to abandon it, taking refuge in the interior. It is in the thirteenth century when Alfonso IX rebuilds and populates the old port giving him the name Crunia. Thus began centuries of prosperity and growth brought about by maritime trade. However, the Tower of Hercules remains abandoned, using in the 16th century much of its stones to build the castle of San Antón and the walls that would defend the city from the English attacks. It is necessary to wait until the XVIII century to see how the tower recovers its protagonism, because at that time A Coruña maintains an intense commercial activity with the Indies, and the ships of America as well as those of other European and Spanish ports arrive at the port with their goods, resulting in the need to provide the port with a lighthouse that guides and makes navigation safer. Its restoration is then carried out. Perhaps because of the fact that it is so old or because of the special magic that it gives off, over the centuries numerous myths and legends have arisen that still continue to be passed on from generation to generation. The best known refers to the foundation of the city of A Coruña and appears even collected in the General Chronicle of Alfonso X El Sabio in the thirteenth century. This legend tells that there existed in these lands a giant called Gerión, which had terrorized all its inhabitants. Then came Hercules, son of the god Zeus, who confronted the giant for three days and, after a hard struggle, won. He kills Gerion, cuts off his head and, on top of it, orders a tower to be built commemorating his victory. It is said that the first person to inhabit these free lands was a woman called Crunna, whose name would baptize the new city. The curious thing is that, in spite of being a legend, since 1448, in the shield of A Coruña they are represented Tower of Hercules and the skull of the tyrant Gerión. Such is the value and importance of this lighthouse that in 1931 is declared of Cultural Interest and, in 2009, monument of World Heritage. On September 9th, 2008, with the collaboration of the Torre de Hércules Institute of Studies and the Natural Service of Natural Parks of the United States, it was united with the Statue of Liberty, thus strengthening the ties that unite these two monuments on both sides of the Atlantic. That same year it would also twin with the Morro Lighthouse, a lighthouse located in Cuba with an antiquity of 153 years. If you want to discover more and even be part of that light that for so many years has been (and it is) a reference point for hundreds of thousands of navigators, you should only approach A Coruña and climb the 234 steps that separate it from the ground. It really deserves (much) worth.